Add links to pictures, videos, etc. on your website or on other websites (such as your local newspaper). 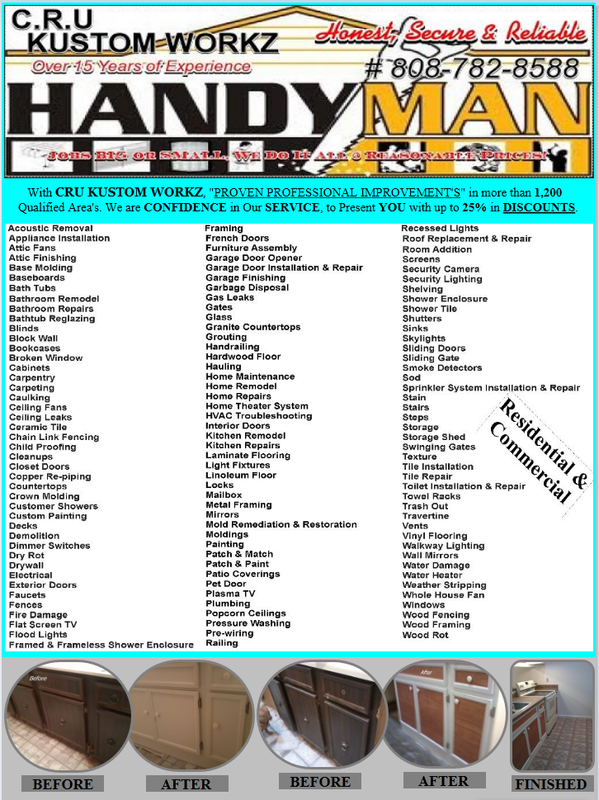 CRU Kustom Workz, an experienced handyman specialist that's trusted in the community, for our unique attention to detail & superior customer service. CALL NOW..
CRU Kustom Workz is on Facebook. Go to our Facebook Fan Page. Just had Cru Kustom Workz come to my house to give me an estimate for a little rental unit with a shower pan that was cracked. He was very honest and fair with his prices. It would have cost me about $1500.00 to replace the shower unit, Cru is no were near that quote, and is using the original structure, just beautifying it, while tiling the floor pan.. Thank CRU KUSTOM WORKZ, for saving me more than half of that other inflated estimate. Lorrie L, Pearl City, Hi.